A crowd of Cyberspace experts along with the best minds in Indian hacking community, leaders in the information security community, policymakers and Government representatives will come together at a common platform to join their efforts in addressing the most critical issues of the Internet Cyberspace. The Groups of Researchers from Information Security and Hacking Community are hosting the 3rd Annual THE HACKERS CONFERENCE (THC) 2014, on 30th August in the Gulmohar Hall of the India Habitat Center, Delhi. In its endeavor to secure the cyber-ecosystem, The Hackers Conference will bring both hackers and government officials together on a common platform with a theme of "Building a secure and resilient cyberspace". Delegates from the more than 10 countries are expected to come and discuss the increasing threat posed by criminal activity online, including hacking and grooming. The major topics on which the conference is expected to cast the light will include Android and iOS Exploitation, Financial Trojans and Credit-Debit Card hacking, New vulnerability in zero-day exploits, Malwares and Botnets development, Cyber warfare, Embedded/Hardware hacking, Blackmarket and Cyber criminals and many more. Information security experts and enthusiasts from all over the world are invited to take part in the Third Edition of The Hackers Conference (THC 2014), and those who wish to present their Research/Hacks/Tools can submit technical Papers on topics such as offensive and defensive technologies, hardware hacking, mobile security, exploit development, reverse engineering, cyber warfare, 0-days, application hacking, malware and botnets, and critical infrastructure security. 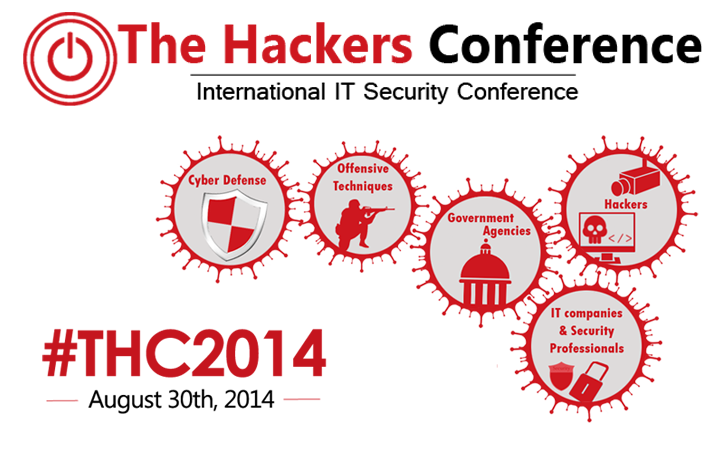 If you are in India or visiting India during the month of August and are also interested in Cyberspace, then The Hackers Conference 2014 is the must attend event for you. Those interested can Register Here.